Finally, after numerous speculations and the long wait, Nokia has officially unveiled it's 2017 flagship smartphone. 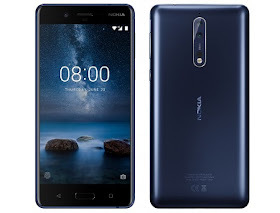 The recently announced Nokia 8 is the fourth smartphone by Nokia under HMD after releasing the Nokia 3, Nokia 5 and Nokia 6 early this year. The 4G LTE enabled Nokia 8 is covered with a 5.3 inches 2.5D curved display with Corning Gorilla Glass 5 protection. It is powered by Snapdragon 835 chipset and also runs on Android 7.1.1 Nougat straight out of the box. Below is the full specifications and price of the Nokia 8. Launch Price: €600 / $675.